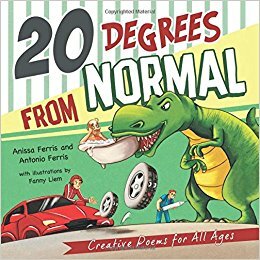 This brother and sister duo has put together a wonderful collection of poems that address a plethora of topics with skill and humor. Almost anyone can find several that will strike a responsive chord. Readers, young and old, will find themselves agreeing with the futility of getting rid of a fly that has entered the house and the annoyance of a leaky faucet. Teenagers will not be able to avoid laughing at the two poems presenting a teenager’s and a parent’s point of view. The importance of everyday objects like the wheel and a lighthouse are simple poems that point out the importance of objects used and seen every day. I really could not stop laughing while reading the poem about a pet spider and the smartest phone. On a more serious note, the authors strike a chord with the poem about a teacher’s real responsibility and the poem which encourages us to soar by realizing that each new challenge entails possible risks. This collection is certainly enhanced by the double-page spread illustrations of Fanny Liem. They are big, bold and vibrant drawing the eye right into the text. I would highly recommend this collection for any family’s bookshelf. Students in the middle grades and older will be able to fully appreciate the messages of the poems. This is my first time reading a book in this series. Delightful story about three monkey siblings, Booey, Fooey and Hooey and their Jungle friends. The book is an interactive reading experience with ample opportunities for the reader to pause and allow the listeners to blurt out their responses by repeating, singing, or animating the sounds and actions of the characters in the stories. In the first tale the three siblings receive a gift from their Grandpa Monk. At first they are puzzled by the red, white and green Christmas balls and stringed lights. Booey, the female, figures out they must be ornaments for a Christmas tree like the one she saw in the town. So they set off to find the perfect Christmas tree. Readers will meet some of their friends like the gorilla, crocodile and turtle. In the end, they find the perfect tree right under their noses. Tale two finds our friends looking over their Christmas list. 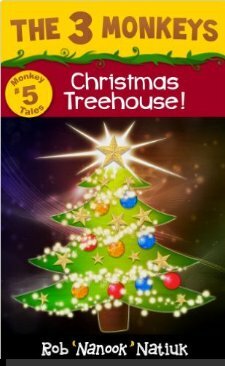 As they travel to Coconut Town, they sing clever monkey songs adapted to familiar Christmas songs like “Jingle Bells,” and “Rudolph, the Red-Nosed Reindeer.” They knock on doors of animal friends seeking to find the true meaning of Christmas. Finally, they discover that, “ A friend in need is a friend indeed.” In tale three, wise old Grandpa Monk tells his grandchildren the story of Santa Paws in the Jungle with his circus wagon pulled by eight zebras. Will the siblings find presents under the tree? The fourth tale speaks of the let down feeling many of us experience in the days after Christmas. Our friends have already tired of their presents; they ponder their New Year’s Resolutions. What do they share with their readers? This book is perfect for elementary school children. Older siblings can read to younger brothers and sisters or the family can share the reading experience. Young children will love the repetition and songs. I will be reading other books in this series. Very entertaining, clever, and highly recommended.